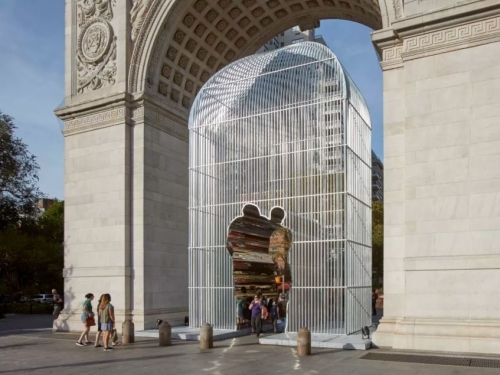 Ai Weiwei conceived this multi-site, multi-media exhibition for public spaces, monuments, buildings, transportation sites, and advertising platforms throughout New York City. Collectively, these elements comprise a passionate response to the global migration crisis and a reflection on the profound social and political impulse to divide people from each other. For Ai, these themes have deep roots. He experienced exile with his family as a child, life as an immigrant and art student in New York, and more recently, brutal repression as an artist and activist in China. The exhibition draws on many aspects of Ai’s career as a visual artist and architect, and is informed by both his own life experience and the plight of displaced people. In 2016, Ai and his team traveled to 23 countries and more than 40 refugee camps while filming his documentary, Human Flow. “Good fences make good neighbors” is a folksy proverb cited in American poet Robert Frost’s Mending Wall, where the need for a boundary wall is being questioned. Ai chose this title with an ironic smile and a keen sense of how populist notions often stir up fear and prejudice. Visitors to the exhibition will discover that Ai’s “good fences” are not impenetrable barriers but powerful, immersive, and resonant additions to the fabric of the city.